Hayley Wickenheiser has a new book for 2010. In Gold Medal Diary: Inside the World's Greatest Sports Event the Canadian Olympic veteran offers a behind-the-scenes view of the world’s most exciting sporting spectacle. "There's a lot of ups and downs emotionally, both personally and from a team perspective. I tried to convey that as best I could and not just the good things, but the frustrations that come with it. I tried to make it as real a story as possible." Wickenheiser goes on to describe the book as "a book about hockey and the Olympic experience and life as an athlete versus my life. The focus of the book was to keep it on the team and the process." It is an interesting backstage look that Wick tries to keep very real for the reader. "Besides taking out the profanity, we tried to keep the emotion in it about how the day was going. It's pretty raw." The book is interesting in that it chronicles Team Canada's captain throughout the season as the players are pushed to achieve a golden standard at the home Olympics. The training sessions and practices are every bit as intense as any NHL practice. These girls work hard, and all for the love of the game, not a million dollar pay check. "I wanted to convey that to people and for them to get a little bit of an insider's view of what it looks like, which may not be as glamorous or as exciting as people think," she said. The book is not an autobiography, rather just a snapshot of her life during this amazing time. It makes for a unique book that all hockey fans should read. "It was an idea I liked and it really hadn't been done before," she said. "I thought it would be important for people to understand what a team or an athlete goes through in the lead up to the Olympics and then actually at the Olympics. A free excerpt of the book is available at the publisher's website. "Hayley Wickenheiser is unarguably the best women’s hockey player in the world. With four Olympic medals (three gold and one silver) she is the heart and soul of the Canadian team. Now thirty-one, Wickenheiser has been on the national team since she was fifteen and has played more games in international competition and has more goals, assists, and penalties than any other woman in the game. She’s also held her own while playing professional hockey on men’s teams in Sweden and Finland. In 2008 Sports Illustrated ranked Wickenheiser as Number 20 on a list of the Top 25 Toughest Athletes in the World. 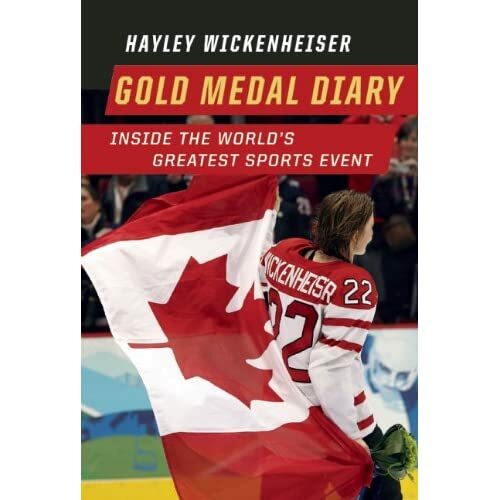 "In Gold Medal Diary, Wickenheiser reveals her day-to-day experience of the 2010 Games, including the six-month lead-up of intensive training and pre-Olympic tournaments. The heart of this book, though, is what Wickenheiser reveals about the life of an Olympian—the behind-thescenes stories, the highs and lows, physical and emotional challenges, struggles and triumphs of an elite athlete in a hyper-intense environment, including details of the public ceremonies and private moments, friendships and rivalries, community and isolation, media presence and security. "For the first time ever, non-Olympic athletes can be on the ground inside the storied Athletes’ Village and understand what it’s like to live through the most high-pressure, high-profile sporting event in the world."